It's not very often that I splurge on something. And I mean splurge. My normal definition of "splurge" would usually entail buying a pair of shoes at Payless without cashing in on the BoGo promotion, paying more than $6 for a bottle of wine, or purchasing anything from Nordstrom. When I do buy something for myself, it's usually either on sale or just inexpensive in general. I love it when my husband gives me a look that says, "Oh, no. What did the loufenn buy now." I always come back with a look that says, "Calm down, nancy. $20 for a seriously cute shirt is not expensive. I'm sorry I can't shop at thrift stores like you. Well, not without looking like an awkward hipster, a homeless vagabond or a woman of the night." There has been one item I've been lusting over for nearly a year. I brought it up a couple days ago, when my husband and I were out and about. me: You know what I want for Christmas? me: It's something I'll never get, though. But I want it so. Jay: Okay, I'm over it. me: Okay, okay! It's a chartreuse vintage style tea table. me: I've always wanted a chartreuse vintage style tea table. It's glorious. I've wanted it forever. Including shipping it was a wee bit less than $150. But, really? I adore it. It is magical. And I like that I'm supporting an artist, and not just a huge retail chain (even though I do love me some Ikea, they are not up to par in their tea table selection). You'd better believe I'm going to have a photoshoot with this chartreuse vintage style tea table when it arrives at the duplex. And, yes, it is necessary to call it by it's full name every time you mention it. It's way more fun/annoying to my husband that way. hahaha!! I LOVE this post and i love you. And?? I LOVE THAT TABLE!!! Chartreuse is all sorts of awesome, I just love ugly/cute colors like that. So worth it honey. I can't wait to see the pics when you get it! Doesn't it feel SO good to finally buy something you've been lusting over for so long?! That purchase seems totally justified! Congrats on your chartreuse vintage style tea table! Haha, what an entertaining conversation to have with one's significant other. I think chartreuse vintage tea table is the epitome of things-that-boys-don't-understand. Seriously adorable though! You definitely deserve to splurge on something you love! It's soooo cute! I love the "loufenn" and the sad face regarding no knowledge of chartreuse. Cute post! I love when I have moments when I explain colors to people and they look at my like I am a odd bird. "Eggplant? The food? The color?" Lol. There are so many things on Etsy that I want to splurge on as well. Especially now since its the Christmas season, all shopping is completely heightened at this point of the year. Yay for the new table, can't wait to see what you do with it in the duplex! Great table! And I'm like you: I rarely spend on myself, and if I do, it's cheap. But everyone deserves to splurge on themselves once in a while. For me, it tends to be on travel, and sadly that is VERY expensive. I remember you talking about this table before, now you finally own it! Yay! Like you, I have a hard time with the splurge. I'm such a bargain hunter. Still, sometimes a girl needs a splurge...and I think yours is lovely! Hiya! I've been reading your blog for a while now, and I just want to say how much I enjoy it. And that tea table is sooooooo cute. Seriously. I love it. Besides, a girl's gotta have a splurge every once in a while. It's, like, the law. Looking forward to seeing your pics of it! Super cute! And $150 for a chartreuse vintage style tea table is nothing to feel guilty about for sure! This reminds me of the French Provencal Pedestal Table that I bought, that my fiance didn't understand, and that I still don't feel guilty about buying. not gonna lie. i had no idea what a chartreuse vintage style tea table was either (had to copy & paste that one fyi) :) but, glorious day! it's awesome. i'm gonna say it again...chartreuse vintage style tea table's (phew) are worth a splurge! ha! chartreuse vintage style tea table. so much fun to say! but I'm the same way when it comes to clothes/shoes, but I tend to splurge more when I go out to eat because I love good food and just can't help myself. I just saw these two at a handmade craft fair here in Indy, I came ::this close:: to buying one of their clocks. I saw this table at there booth and, believe it or not, its actually cuter IRL. Yeah! You'll love it even more than you already do! Haha, I get what you mean about splurging. For us, splurging is when we buy ice cream. I splurged a little while ago when I bought ingredients for baking. We are cheap. But it's fun, especially when we tell people that we had a date at Haggen and Office Max. And that table is adoreable... you've mentioned it before on your blog, methinks. Which, I think, is a reason jay should read your blog: so he knows what to buy you for Christmas! Ha ha... but, totally excited you got it. And very excited to see where you put it! Weeeeee! I think, really, that you *had* to buy it. I mean, how else would Jay learn about chartreuse? Aww, the "sad face" was too cute. And like everyone else that's commented, I freaking love that table! wow,, i have no idea before how amazing is a chartreuse vintage style tea table, but seeing the picture, i would like to say i'm very to die for..It looks so simple and cactchy yet warm. I guess I should go to the furniture near my home to buy one like that. If we don't cater to our own whims every now and then, who will? I believe that surrounding ourselves with things that make us happy is a seriously overlooked tool to fulfillment. I like the word "chartreuse". lol. The table is cute, I never really understand furnitures but I can say that much. :) If it makes you happy then it should stay! 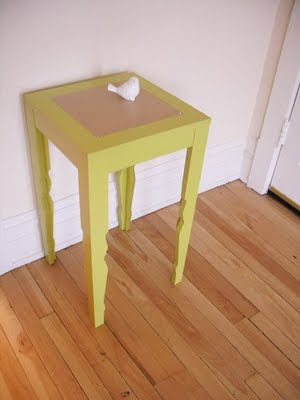 I recently bought a chartreuse table and am punching myself in the face every day until I find a home for it. SEE! Good for you! That table is great. I buy myself presents when I hit milestones in my Etsy shop too. 300 was a pair of red leather riding boots with buckles up the back, if I remember correctly. um love it! super cute and love that color. woo for splurging, everyone deserves it every once and a while.